Just like avocados, Chia Seeds have become part of the “trendy” food stuff category. I’m sure you’ve seen pictures of chia bowls pop up on your social media feed. If you haven’t, well, you should go on Instagram and Pinterest, and check out photos and recipes of those creative bowls. But what’s with all the hype? Is it just a fancy way to make your food prettier? And what is chia seed, anyway? For those of you who aren’t familiar with these super-seeds, Chia Seeds are one of the world’s oldest sources of nutrition. It was cultivated and served as a staple food in Aztec Cultures during the pre-Columbian times. Today, Chia Seeds can be cultivated on a small scale in central Mexico and Guatemala, and grown commercially in Argentina, Bolivia, Ecuador, Guatemala and Mexico. Chia seeds are loaded with antioxidants. Antioxidants help fight free radical damage in the body that can cause significant damage to our living cells and tissues, resulting to premature aging and various diseases. That’s why it’s very important to load up our bodies with lots of antioxidants, and Chia Seeds contain a lot of them, even more than blueberries (some studies claim). Chia seeds carry Omega-3 fatty acids. Your sources of these heart-healthy fatty acids would typically be salmon, sardines, mackerel, tuna, as well as leafy greens, but did you know that Chia seeds are also packed with Omega-3s? So if you want to take a break from seafood to get your dose of Omega-3, make sure to consume at least two tablespoons of chia seeds – sprinkle it on top of your oatmeal, salad, etc. Chia seeds contain a lot of fiber. 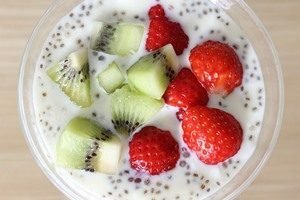 Two tablespoons of chia seeds already have almost 10 grams of fiber, and research shows that consuming 30 grams of fiber daily can help with weight loss. Aside from filling you up, the amount of fiber in chia seeds will also promote good digestion. Chia seeds are good sources of protein. These teeny weeny seeds are 14% protein, and you know how our bodies need protein intake. Chia seeds are good plan protein sources for vegetarians. Chia seeds also contain calcium. If you don’t like dairy, one of the best non-dairy calcium sources would be Chia seeds, to help your bones stay strong. Those who are on a gluten-free diet will still be able to consume these super-seeds. Bottomline, these seeds will nourish your bodies with massive amount of nutrients while being low in calories. No wonder why it’s so popular in the healthy food scene. This entry was posted in Good Health, Superfoods. Bookmark the permalink.